I think I have mentioned our many fruit trees before. We have 3 cooking apple, 4 eating apple, 3 pear, 3 plum, 2 greengage, a mirabelle and at least 4 cherry plum. Having all of these mature trees here has meant an abundance of fruit, which has been awesome. The downside is that all trees need maintenance and from what we can see these trees have been neglected for many years. We’ve been clearing away dropped and diseased fruit, brambles around them and the chickens have done a very good job of clearing the grass around the base. All of that should help but what the trees really need is a prune. Pruning sounds simple enough, cut some bits off and voila, but I’ve actually been really scared of it. If you do it at the wrong time of year you can leave the tree susceptible to disease and poor growth, if you cut too much off it can turn into a spikey hedgehog throwing up loads of new shoots and the very idea of cutting off branches that would have given me fruit later feels like throwing the fruit away. So why do it? The current state of the apple trees means that the fruit is actually lying on the floor while it is still on the branches. We made some supports last year which helped a bit but a lot got damaged and more were eaten by the chickens. When branches are criss-crossing each other they rub which can damage the bark and leave the tree open to disease. Branches that are all close together means less airflow through the tree and again leads to disease. All the trees in the garden have had some instances of brown rot which is a fungal disease, more airflow should help us fight it. This past weekend we finally took the plunge. I have the Fruit Tree Handbook by Ben Pike which talks about pruning in general and in relation to restoring older or neglected trees. We had a quick read, not as in depth as I would have liked but that comes with trying to do anything with a toddler, and decided to start with the Beauty of Bath eating apple tree. It looks to us like a previous owner actually trained the tree to grow it’s branches downwards, they bend down at quite the angle. Unfortunately that means a mass of braches and loads of apples on the floor. They’ve done this with two of the cooking apples aswell. The book said to take off no more than 20% in the first year and to look at restoration as a several year project so that is what we did. The pictures aren’t great but I can certainly see a difference. I just hope we didn’t take too much off. Next I had a go at our russet apple tree, we don’t know what type of russet it is, but it produces small tasty apples so we like it. They worked really well dried last year. The tree itself is very small and tucked behind the Beauty of Bath and under our largest Cherry Plum. I only took a few branches off of this, mostly where they were tangled with the Beauty of Bath or where they were crossing themselves. The next tangle was our 3rd eating apple tree, we have no idea what type it is so we call it Eating Apple (EA) 1, and one of the cooking apple trees called Cooking Apple (CA) 1 (I just went anti-clockwise around the garden). I had to tackle them together as they are that tangled that you can’t really tell one from the other at the moment. I started on the eating apple side and did my best to free it from the cooking apple. Again we liked the taste of these apples and they came in earlier than the other eating apples so more of them would be good. Unfortunately, due to the crowding and an awful problem with coddling moth I think we got 2 apples from this tree last year, the rest were inaccessible, infected with brown rot or riddled. I am hoping that if we can get to it this year, and get the chickens access to scratch around the base, then we can reduce the coddling moth and airflow will help with the rot. We only managed to tackle CA 1 in as far as it was encroaching on EA 1 as it started getting late and my confidence had grown to the point that we decided it probably didn’t need to be a two person job. A lot of the jobs around our smallholding are split into one person or two person jobs. One person jobs I try and do during the week with Chi, unless I don’t have the skills to do them, in which case it goes on Sam’s list if he does. The two people jobs, because it is a bigger job, needs more hands or I am just not confident doing it on my own, wait until a weekend, evening or Sam has a day off. I am getting a bit more confident at trying some jobs on my own but I was really worried about taking too much off the trees and just cannot judge if a pile of twigs is 20% of a tree or not! The prunings from Beauty of bath. 20% of the tree??? Once I had a vauge idea though, we decided I could probably manage on my own (Sam had spent most of the pruning time fixing a broken tap so we finally have water in the back garden again – oh and entertaining Chi). 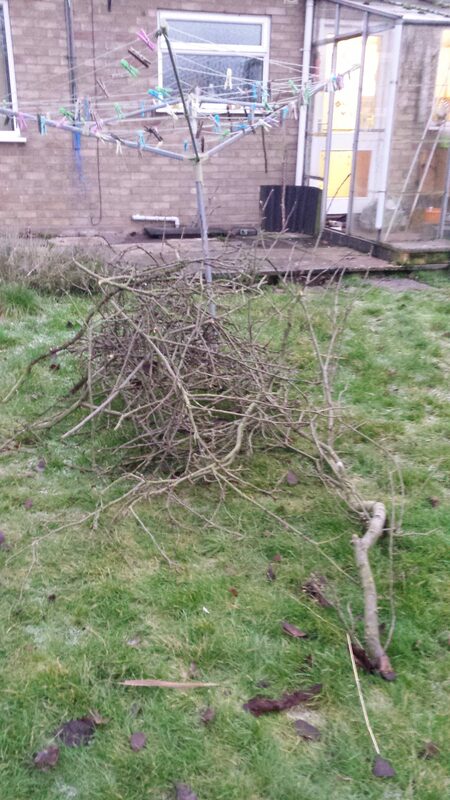 We then turned to another fruit tree related 2 person job, planning out the orchard. We have planted 4 fruit trees in the orchard so far. We weren’t very sure about spacings so we went with 4m around each tree. Those trees were penned off with chicken wire to keep the geese away and mulched with old hay to keep the grass down around them. Sam and I worked at getting some bamboo canes in to mark out where the rest of trees will go until it got so dark we couldn’t actually see the bamboo canes. Now I have a new one person job, dig holes for the trees! We bought 8 trees when our garden centre was having a clear out. They are older trees, probably not in the best of health and I am pretty sure 1 is dead (possibly more after having spent the autumn and winter in the polytunnel) but they were stupidly cheap (£2-5) so we will give them a go. I’m not sure what the geese will think when they go back in and find even more trees in thier area! Now I just need to prune CA1, CA2, the three pear trees and EA2. At least we will have plenty of kindling for next winter’s fires!